*The Omega Live comes with two 9” inch extension adapters that are both terminated with a gold-plated 4 pin balanced XLR female connector on one end, and a 3.5mm stereo mini & ¼”/6.3mm on the source side. The TARA Labs Headphone Cable Series are a revolutionary new high-end audio cable series from TARA Labs. The Omega live” is the ultimate in high-end audio headphone cables. 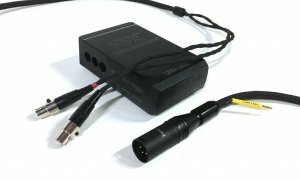 The HFX Floating Ground Station / Omega Live: Is an extraordinary component that is included with The Omega Live audio headphone cables. TARA Labs proprietary ground station system is made of mil-spec aluminum alloy. Our specific metallurgical properties allow for the reduction of radio frequency interference (RF) and electromechanical resonance; EMI/RFI. It's 18.23% heavier and stronger than aircraft-grade stock. Equipped within the HFX station is a patented ceramic composite of metallic oxides and an amalgam of mineral elements in a proprietary ceramic binder called "Ceralex." Because the HFX functions completely outside of the signal path, its ability to dissipate and eliminate the effects of EMI/ RFI (Electromagnetic interference & Radio frequency interference) which also includes sonic distortion, noise, "snow", and lack of image clarity. What the listener will hear using the HFX system is more high frequency extension, incredible details, tighter bass and full mid-range, including enhanced musicality and neutrality which are all signature characteristics of TARA labs high-end audio cables. The HFX Floating ground Station System comes complete with a variety of mini banana & spade leads to connect it to virtually any component. What the listener will hear with the Omega Live w/HFX headphone audio cables will be a sound that has an exceptionally low noise floor and black background. Extreme high frequency extension, that is full of hidden details, with superb micro-dynamics. Full rich mid-range and tightly defined bass that is powerful and has punch. Full range of sound frequencies are afforded to the listener, as well as exceptional soundstage that is absolutely holographic, as well as extremely spacious and precise. The spatial cues are very well defined, with exceptional nuance of delicate details in the music. Musicality is phenomenal! The Omega Live w/HFX ground station system cable is custom hand-crafted at our factory in Oregon, USA, and lifetime guaranteed.